The Thirteenth Judicial District Commission on Judicial Performance unanimously recommends that Judge Michael K. Grinnan BE RETAINED. 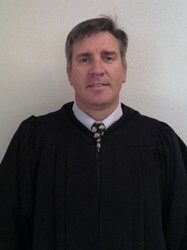 Judge Grinnan was appointed to the bench in January 2007 where he serves as a part time County Court Judge. He earned a Bachelor of Arts in Political Science from Fort Lewis College in 1990 and a Juris Doctor degree from Denver University Law School in 1993. Judge Grinnan’s legal experience includes: Burlington City Attorney, county attorney for Yuma County, deputy district attorney and a private attorney practice. He is currently an active member of the Colorado County Attorney Association. In his community, Judge Grinnan is a board member for Hide-Away at Cameron Lane, a nonprofit horseback riding program for handicapped persons where he even uses his own personal horses in the program. He is an assistant head coach for the Burlington High School Wrestling Team and also tries to find time to attend his own children’s numerous athletic events. Evaluation averages of both attorneys and non-attorneys were slightly below the state average for all county judges eligible to stand for retention. Evaluation averages from attorneys were slightly lower than those of non-attorneys. In Judge Grinnan’s previous performance review, a concern from attorneys was that the Judge appeared to be defense orientated. The current survey results still showed a slight lean toward the defense in sentencing but there appears to be significant improvement in Judge Grinnans efforts to move toward a more neutral position. His strengths include striving to see that justice is done and he is very good at treating all parties with dignity. Weaknesses noted by attorneys focused on his ability to control the court room, but indicated that a majority of the time, this was not issue. Strengths noted by non-attorneys focused on the fact that Judge Grinnan ran a tight ship and that he used verbal examples to help defendants understand the issues. He is noted for being an outspoken, friendly and very generous person.